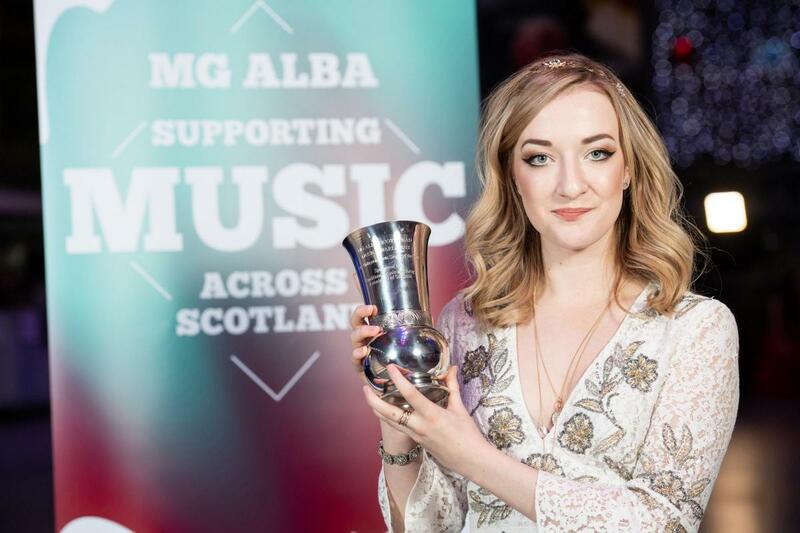 Aberdeenshire folksinger, Iona Fyfe has been titled Citty Finlayson Scots Singer of the Year at the MG ALBA Scots Trad Music Awards which were held at Perth Concert Hall on Saturday. Iona, 20, from Huntly is in her final year of studies at The Royal Conservatoire of Scotland and is one of the youngest recipients of the award. Her debut album, Away From My Window, was released in March and was held to critical acclaim and received nationwide airplay on programmes such as BBC Radio 2 The Folk Show with Mark Radcliffe, BBC Radio 6 Gideon Coe, BBC Radio Scotland’s Travelling Folk, Take The Floor and BBC Radio Nan Gaidheal. With a number of high profile appearances under her belt, Iona has spend 2018 performing in the UK, Germany, Austria, Poland, France Italy, Switzerland and Canada. With her band, Iona performed at Interceltique Festival De Lorient where she was described as “a Scottish folksinger, magical and charismatic” (Rolling Stone, France). Hands up for Trad celebrated Scotland’s vibrant traditional music scene at the weekend with 20 awards announced at the MG ALBA Scots Trad Music Awards. Produced by Hands Up for Trad and a staple in the Scottish music calendar, the ceremony was broadcast live on BBC ALBA and BBC Radio Scotland this evening, as well as being streamed worldwide. The event saw an abundance of music fans and industry gather in Perth, for an evening of recognition and foot-stomping live performances. Hosted by world-renowned Gaelic singer, Mary Ann Kennedy and award-winning musician, Kim Carnie, the evening champions Scottish music, heritage and tradition.